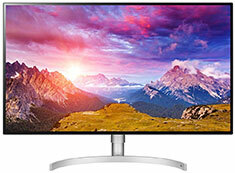 The LG 32UL950 UHD Monitor with Thunderbolt 3 features a large 32in screen size, 3840x2160 resolution, 5ms GTG response time, IPS technology, HDMI, DisplayPort, Thunderbolt 3, USB, FreeSync technology, HDR10 support, speakers, VESA 100mm support and more. Discover a more lifelike picture with high dynamic range, which provides bolder contrast between the brightest and darkest areas of the screen. This HDR 600 monitor has been rated to deliver impressive peak luminance of 600 nits for undeniably spectacular highlights.